Certain periods in the making of history have been deficient in contemporary chronicles. This is notably true in the history of American education during the eighteenth century. Such history presents lessons to the educator of a later generation. As we follow the growth of the American people from the status of settlers in a new country to that of a distinctive nation with its own life to provide for by training and education, we are led to an understanding of the American character and civilization of our own day. This understanding is necessary for all those who are engaged in the attempt to prepare boys and girls to take their places in the present social structure. The history of education is made up in part of accounts of various subjects which have developed into courses of study. mathematics of some kind has always been included in such courses. In the American Colonies arithmetic was an important subject for practical reasons. It was needed for trade and commerce. With sailing vessels plying between Europe and America and the only means of communication with the "homeland," navigation and all the kinds of sailing that had to be put to daily use came to be a continuation of the course in arithmetic. Astronomical observations were an important feature in laying out a course at sea, and so astronomy is found in connection with arithmetic. Some elementary trigonometry, logarithms, and geometric constructions played a necessary part in the calculations incident to both navigation and astronomy. With this list the practical uses of mathematics in that day are exhausted. 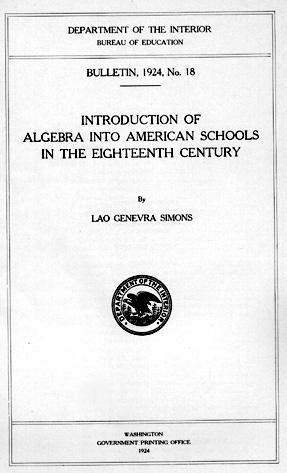 It is the purpose of this study to show that algebra, another branch of mathematics, entered into the American education of the eighteenth century, and to show further that we must seek some other reason for its presence than a practical need for it.